See, I told you guys I have actually been DOING stuff! I was sitting around the game table last weekend with the fam and mentioned that I was waiting until closer to October to start listing all the Halloween stuff I'd done. They were appalled and asked why I hadn't listed it all already?? Well, here's the beginning! Z.O.E. is involved in two different events for October, one of which I'm sponsoring, so I'll show you those items later on. For now, here's what's in the shop and listed this weekend for Super Sale Weekend! 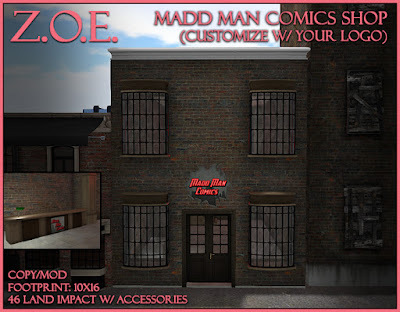 The Madd Man Returns! Kinda! Creepy, Creepy, Make Ya Weepy! Yep, I know that title blows. Oh well! Hey guys, nice to chat at you again. I've been muy busy the past couple of weeks between getting some Halloween stuff ready, and preparing for Hurricane Irma. By preparing, I mean watching the Weather Channel 24/7 and silently freaking out while hoarding mass amounts of water, ice and non-perishables. Anyway, I have the first offering for Halloween 2017 for you. This building is a "safe" listing, meaning it can be for Halloween or not. This build will fit in nicely in an any urban grunge setting. It is a filler building, so you can't actually go inside. These dummy buildings are more for lower prim scenery. This particular one isn't as low prim as I'd like, but it's really freakin' cool! 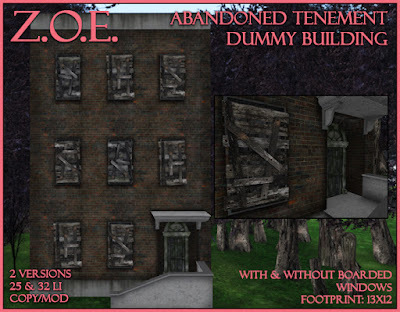 It comes in a boarded up window version, as well as a lower prim broken window version.